Como falo em inglês: Para de ficar apontando o dedo pra todo mundo! Hey, everyone. Nesse episódio do podcast Inglês Online eu vou falar sobre expressões em inglês com a palavra finger. Aproveito para esclarecer que finger é uma palavra usada para designar os dedos DAS MÃOS! Os dedos DOS PÉS chamam-se toes. Hello! How have you all been? Today we have a new episode of the inglesonline podcast. Please subscribe to this podcast using the Podcasts app for iPhone or iPad, or listen to the episodes using the Inglesonline Android app. To download or just listen to other episodes and download transcripts, go to inglesonline.com.br and click Podcast Inglesonline. So, yeah! Today we have a few expressions with the word finger. It think it’s safe to say that all of you – maybe with a few exceptions – know what a finger is. 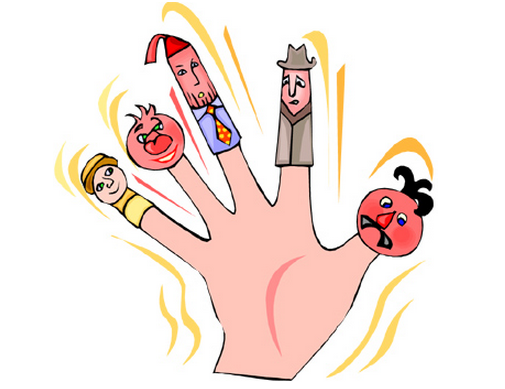 A finger is one of the five digits of the hand. There are loads of expressions and terms with the word finger… And here’s our first term for today: point the finger at someone. So imagine someone literally pointing their finger at another person. Let’s say this guy, Andrew, is literally pointing the finger at this other guy, Tom. So if that looks to you like Andrew is blaming Tom for something, then you got the right idea for what the expression “point the finger at someone” means. Check out this sentence I found on Twitter: People are quick to blame and point the finger but can’t ever take responsibility for what they do. Again: people are quick to blame and point the finger – so the person who wrote this is just emphasising what they mean by using the expression “point the finger”. People are quick to blame and point the finger, but can’t ever take responsibility for what they do. This person is saying that it seems people are never able to take responsibility for what they do – they can’t ever take responsibility for what they do. That’s a bit of an exaggeration, right? Some people do take responsibility for what they do, but there certainly are a lot of people who don’t. Interestingly enough, many people who don’t take responsibility for what they do are quick to point fingers. Here’s a variation of my previous example: Pointing fingers and blaming others is another way of not taking responsibility. You’ll hear that a lot: “pointing fingers”, or things like “I’m not gonna point any fingers, but our files have been corrupted and we need to be more vigilant from now on”. Or something like “We need to take action in order to prevent another disaster like this. This is not about pointing fingers; it’s about joining forces and working as a team”. Pointing fingers. It’s not about pointing fingers; I’m not gonna point any fingers. That means, I’m not going to blame anyone. I’m not going to openly accuse anyone of doing anything. I’m not gonna point any fingers. Here’s our second expression of today – listen to this: the world is full of people willing to tell you what needs to be done, but not willing to lift a finger to help. Yeah, our examples today are profound. Food for thought. There’s another expression: food for thought. So, anyway, here’s the example again: The world is full of people willing to tell you what needs to be done, but not willing to lift a finger to help. I think you get the picture… Someone who’s not willing to lift a finger is someone who’s not willing to make even a small effort – you know what I mean? This expression is frequently used in that sense – in the sense of someone who’s not willing to help. Sort of a negative meaning. However, it is also common to use that to express simply that you don’t want a certain person to make any effort; or that you wish you didn’t have to make any effort, and so on. Listen to this example I found: “When my grandma visits my house she offers to help everyone with everything but I make sure that lady doesn’t lift a finger”. So this guy is saying he doesn’t want his grandmother to do any work: he makes sure she doesn’t lift a finger. He wants her to rest; to relax and do nothing. He makes sure she doesn’t lift a finger. It’s your turn now: what are your examples for “point the finger” and “not lift a finger”? Let us know in the comments, and talk to you next time! I usually lift a finger in my own house, out of my house I don’t run the show. On the contrary, when my mother visits my home it’s impossible to stop her, she is a very active person so she lifts a finger all the time. I must say, she is a blessed Mom ever and help me a lot. Olá! Gostaria de saber a expressão que costuma ser utilizada para dizer “foi sem querer”. Hi , Ana!Nobody is perfect under the sun,so I think we shoud think twice before pointing someone finger.That is not the best thing we can do to solve problems.Kisses!!!!! Previous Post Um ditado em inglês: Nice guys finish last Next Post Como falo “tome cuidado quando estiver cruzando a rua” em inglês?